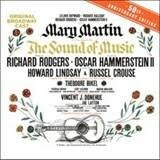 Just released on November 3, Sony Music has brought us the 50th Anniversary special edition original Broadway cast recording of The Sound of Music featuring Mary Martin (remember Peter Pan?) and Theodore Bikel. It has all of the songs we know and love by Rodgers & Hammerstein like”My Favorite Things,” “Climb Ev’ry Mountain,” “Maria,” “Do-Re-Mi,” and “Edelweiss,” but also includes three rare bonus tracks, new liner notes, and candid photos of recording sessions! and a soaring cover version of “Climb Ev’ry Mountain,” sung in Swedish (as “Sök dig till bergen “) by Tommy Körberg, best known to American audiences for his vocals on the concept album of Chess. The album is available at Amazon.com for $10.99 (and is eligible for Super Saver FREE Shipping), or for $28.80 when you buy both the CD and the gorgeous matching pop up book. Sony Music provided me with a copy of the CD for review and I immediately listened to it the whole way through. I already love The Sound of Music, having grown up with the video version and also having been in a full stage production of it after high school. I honestly had no idea that Mary Martin played the original Maria Rainer and was quite excited when I heard her voice on the recording! The CD is excellently done, especially for being an original recording. The sound is clear, the singers on key, and the story that just the music weaves is engaging. On top of releasing such a neat CD, Simon & Schuster “adds to The Sound of Music phenomenon with a collectible pop-up book for every family’s library. The heartwarming, classic adventure – adapted by Bert Fink from the story of the stage musical – comes alive with paper engineering as unforgettable as each timeless melody” (per SonyMusic). The beautiful pop-up book The Sound of Music is available on Amazon.com for $17.81 and eligible for FREE Super Saving Shipping. I was also sent a copy of this book to review and could NOT believe my eyes when I opened it up. To me, this book is a keep sake treasure! I first went through it page by page, loving the intricate work put into the pop up parts, and also enjoying the narrative and lyrics included everywhere. My 1-year-old daughter sat on my lap and was enthralled with each turn of the page, as well. I’m sure this will be a story we read and re-read as the years go by! An interesting thing to note is that the story line leaves out scarier or more intense moments of the story. There’s isn’t talk of the Nazi occupation in Germany, and the reason why the von Trapp family must flee to Austria isn’t really explained. I personally appreciate this, though, as it makes the book appropriate for little ears but leaves room for a parent to explain these details if he or she so desires. The photos don’t do this book justice, so please check out the video of it here or just look through it at your local book store. On top of that, you can download a free Sing-Along activity kit for the book here. It’s seven pages long, reproducible, and contains colorful activities pertaining to the book (though you don’t need the book to complete the activities–it can stand on its own). Math, writing, logic, and art skills are all part of the package. Win It! Sony Music is providing one reader with a copy of the 50th Anniversary special edition CD recording of The Sound of Music. To enter, you will need to download and view the Sing-Along activity kit and tell me something you like or dislike about it. Be specific and don’t copy someone else’s answer, please! If you are unable to download the kit, you may instead tell me why you’d like to win this CD. Please include an email address in each comment–and leave a separate comment for each entry! Contest will end December 31, 2009 at 12:00pm EST. Love the picture search! Those are always so much fun to do with kids. I like all the different activities but especially the word search and the make your own rules pages. I know my child would love to make her own rules! I found your site sometime this summer when you did a bunch of cloth diaper giveaways and I was just starting to cd…sorry i don't remember what initially pointed me here. Can't download the kit from this computer, but I'd love to win because I'm a huge fan of the Sound of Music! I commented on the Mrs. Meyer's post. I would like to win becuase it would make a great gift for my sister. Thanks! I'd love to win the CD because the movie has always been a favorite of mine and I've never had the music to listen to at whim. I know my girls would love it too! Thanks for the chance! I entered the Mrs. Meyers giveaway. I think I found you on Prizey. Thanks! I like that I can get all the words to the songs in The Sound Of Music. The only one I know is Do-Re-Mi. All the others I know just the refrain and have to hum the rest of the words while the melody stay in my head for hours.